This post was originally featured on Greenboard, the blog of the Environmental Science and Policy Program at Michigan State University on May 31st, 2018. Di Liang is a PhD candidate and LTER grad in Dr. Phil Robertson’s lab at MSU’s Kellogg Biological Station. Di Liang (Plant, Soil and Microbial Sciences) is researching the soil microbial sources of the greenhouse gas nitrous oxide. 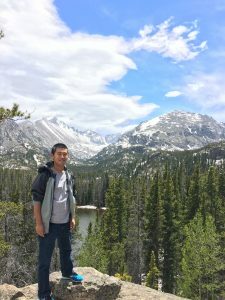 Di Liang is a doctoral student in the Department of Plant, Soil and Microbial Sciences and MSU’s Kellogg Biological Station. This summer, he is working to identify the soil microbial sources of the greenhouse gas nitrous oxide. It is his hope that knowing how these microbes contribute to N2O fluxes can offer additional greenhouse gas mitigation options. Because soil nitrification converts ammonia to nitrate (NO3–) and releases greenhouse gas N2O as a byproduct, it is an ecological process that directly influences agriculture ecosystems and links to climate-food-energy-water (CFEW) interactions. This nitrate is readily available for crop uptake, which supports food production. But it is also a water pollutant that can be easily leached out and negatively affects water quality, Liang said. Additionally, N2O has a global warming potential 300 times higher than CO2. “I am reviewing the ecological importance of soil nitrification and proposing new research to assess the net ecosystem services of soil nitrification,” Liang said. This has a huge potential because one third of anthropogenic greenhouse gas emissions are from agriculture – specifically food production, fertilizer manufacture and food storage and transportation. Additionally, the use of synthetic fertilizer has been proven to be the main cause of the increased atmospheric nitrous oxide, the third most important anthropogenic greenhouse gas in the atmosphere. “To better mitigate greenhouse gas emissions, understanding the linkage between microbial processes and water-energy-microbes interaction is critical,” Liang said. Liang’s adviser, Dr. G. Phillip Robertson, a University Distinguished Professor at the W.K. Kellogg Biological Station, believes Liang’s research could lead to changes in the interactions of the microbes that could mitigate climate change.